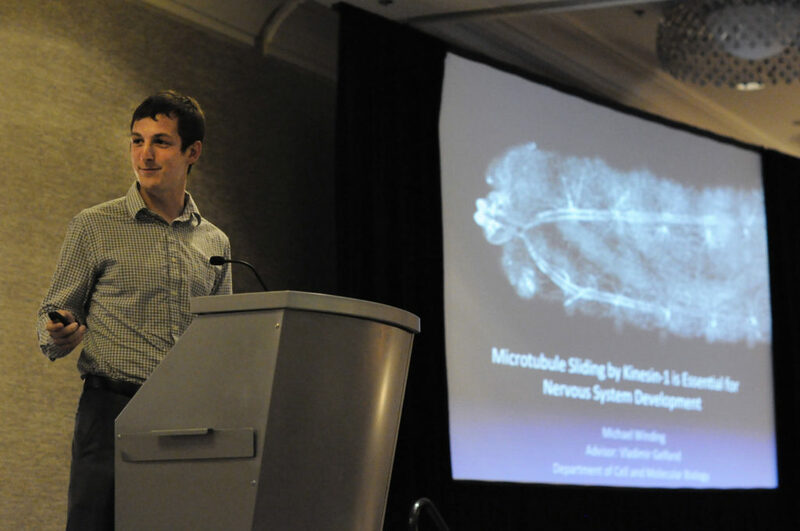 Michael Winding, ’16 PhD, Driskill research award recipient, presented on the role of microtubule sliding in the nervous system at the fifth annual Driskill Day. This year, the Walter S. and Lucienne Driskill Graduate Program in the Life Sciences (DGP) established new traditions for its fifth annual Driskill Day, including presentations by third-year students with advice for new students and scientific games hosted by second-year students. 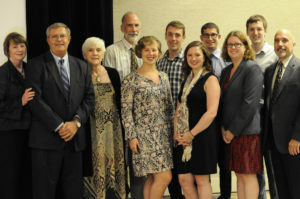 At the beginning of the event, held Friday, September 9, the four research award recipients presented their thesis projects, which were nominated by faculty and chosen by the program committee based on work that was of exceptional quality and made a strong impact on the research community. 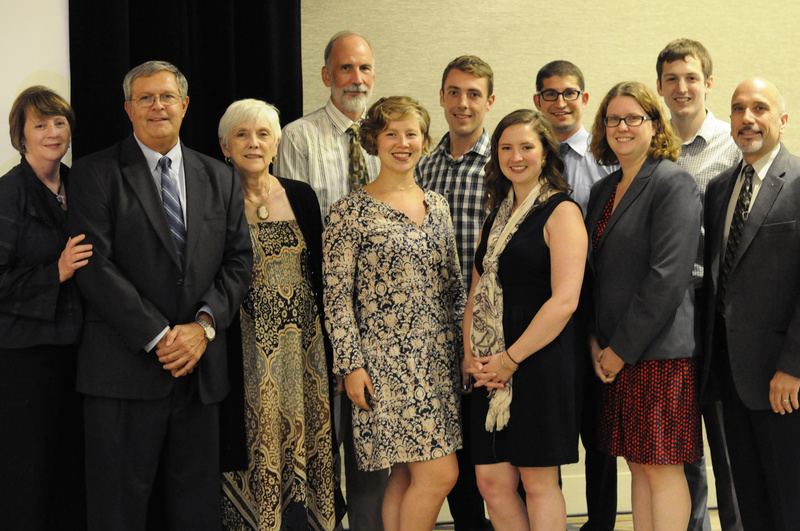 Members from The Driskill Foundation and the Driskill Graduate Program in Life Sciences recognized research award recipients for their contributions to science. Benjamin Smith-Goldenson, ’16 MD, ’16 PhD, now a resident at University of California, San Diego, presented on the development of megakaryocytes, a type of cell in bone marrow that is responsible for the production of platelets and the role it has in leukemia. He worked in the lab of John Crispino, PhD, Robert I. Lurie, MD, and Lora S. Lurie Professor of Medicine in the Division of Hematology/Oncology and Biochemistry and Molecular Genetics. Kyle O’Hagan, ’16 PhD, presented on the protein Pak2 and its role in the development of regulatory T-cells, a type of immune cell. He worked in the lab of Hyewon Phee, PhD, adjunct assistant professor of Microbiology-Immunology, and will be completing his postdoctoral training in the lab of Stephen Miller, PhD, Judy Gugenheim Research Professor of Microbiology-Immunology. Michael Winding, ’16 PhD, presented on the role of microtubule sliding in nervous system development of flies. He worked in the lab of Vladimir Gelfand, PhD, Leslie B. Arey Professor of Cell, Molecular, and Anatomical Sciences in the Department of Cell and Molecular Biology. 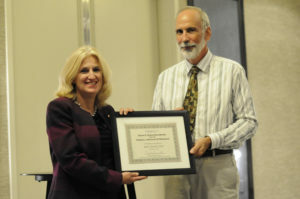 Karla Satchell, PhD, professor of Microbiology-Immunology, was awarded the Dean’s teaching award by Steve Anderson, PhD, associate director of the Driskill Graduate Program in Life Sciences. Driskill Day recognizes the $10 million gift from The Driskill Foundation made in 2011. DGP is comprised of 19 departments, including basic science and clinical departments, 188 students and 160 faculty members. Throughout the evening, other awards were presented: Megan Wood, PhD candidate in the lab of Cara Gottardi, PhD, associate professor of Medicine in the Division of Pulmonary and Critical Care Medicine, received the student service award; Christopher Payne, PhD, assistant professor of Pediatrics, received the faculty service award; and new this year, Karla Satchell, PhD, professor of Microbiology-Immunology, and Murali Prakriya, PhD, associate professor of Pharmacology, received the Dean’s teaching award.